Sounds of the wild turkey were being heard at the band gazebo of the Harford Fair grounds on August 25 as the Wilson F. Moore (WFMM) Chapter and the Full Fan chapter of the NWTF partnered to hold sanctioned a National Wild Turkey Federation (NWTF) turkey calling contest. It was fortunate for these two NWTF chapters that they were able to join up with the Harford Fair Open Turkey Calling contest to hold two contests on the Saturday morning. The Harford Fair Open Turkey calling contest has been running for over 15 years with the determined efforts of Judi Sartell, family and friends. Sartell graciously worked with NWTF Life member Dave Wilcox of the WFMM chapter to work out details and coordinate holding two turkey calling contests. Dave Wilcox and members of the WFMM chapter and the Full Fan chapter had been planning for months on how to revive a sanctioned contest that dates to the 1970s, the Susquehanna Open. The 2018 renewed Susquehanna Open Turkey calling contest would become a sanctioned event by the National Wild Turkey Federation. A NWTF sanctioned contest means that the winners of each class would be eligible to go to Nashville, Tenn., in the winter of 2019 to take part in the national NWTF Calling contests. The classes in the Susquehanna Open were Poults, Jakes and Seniors. In the Senior Division there was stiff competition from callers who were previous national champions – Hunter Wallace of Wayne County (a 4-time NWTF Junior National Champion) and Larry Scartozzi, a previous state Champion and an award winner at past NWTF National Calling contest. This year, Scartozzi edged out Hunter to become the first-place award winner in the Senior Division of the 2018 Susquehanna Open Sanctioned NWTF turkey calling contest. More about the contest will be featured in a future article. 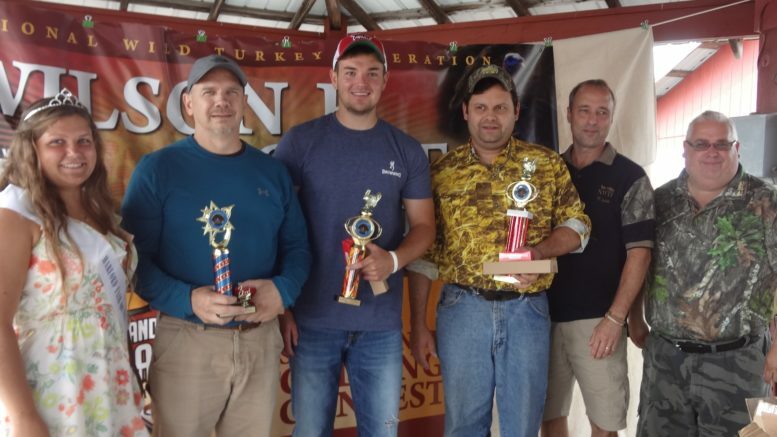 Be the first to comment on "NWTF sanctioned turkey calling contest held at Harford Fair"